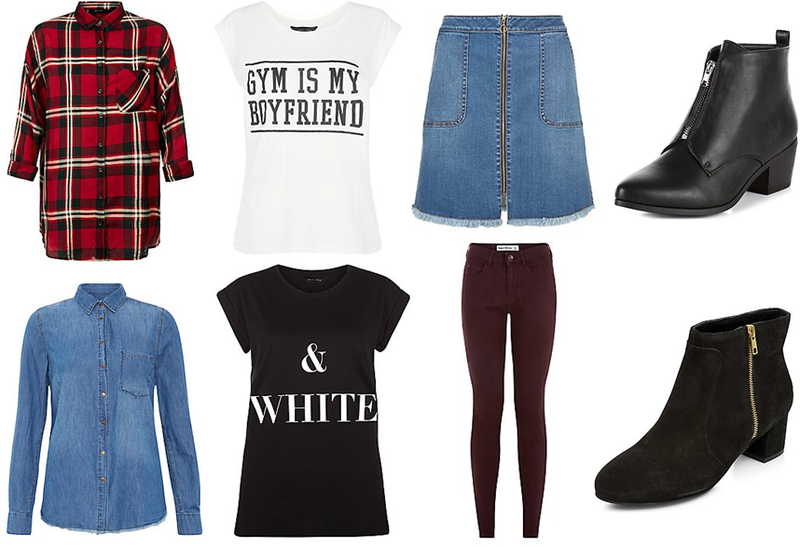 In desperate need of some outfit inspiration for the first week back at school? Don't you worry because I have put together five different outfits to cater to all of your style needs! If you want, you can mix and match some of the pieces I have put together or if your school rules place restrictions on what you can wear, simply substitute the "problem item" for something that does fit the requirements - too easy! 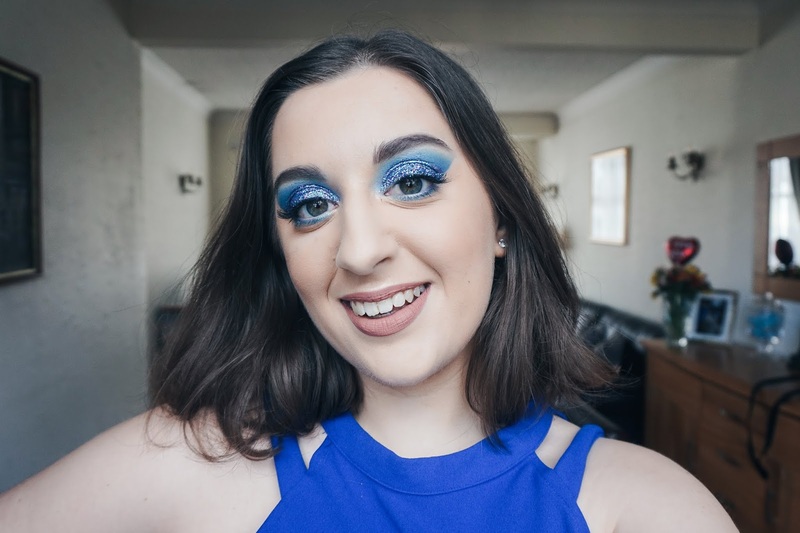 If you have already started back at school, sorry that I am a bit late with this but you can still draw some inspiration to incorporate into your outfits! I start back next month and I have heard that some start even later than that, nevertheless I hope that you like the outfits and have fun perusing! P.S. 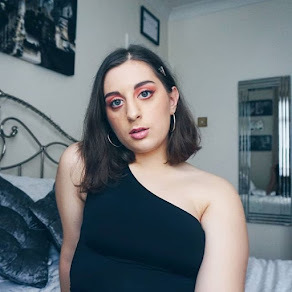 All of these looks can be shopped at New Look in the 'New In' section! 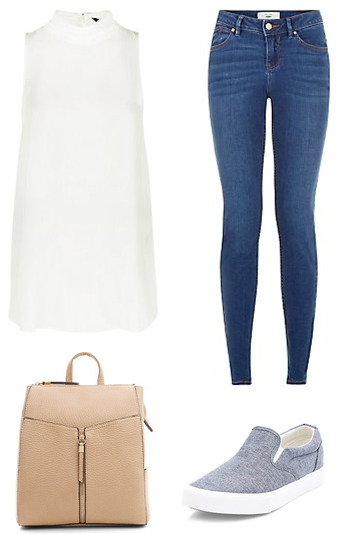 Get that feminine touch on the first day of school by pairing light coloured jeans with a flowy top for a bright and airy feel! This white longline tunic top helps to get you through that awkward summer-autumn transition stage whilst the camel backpack ensures that you're carrying your books in style! Finally, add these blue flecked slip ons for those days that you're running late but don't want to compromise your overall look! Okay I must admit, I pretty much had Blair Waldorf in mind for this look minus the hair accessories and attitude! I just love the idea of pairing a plain shirt with a printed skirt and jazzing it up with a pop of colour. 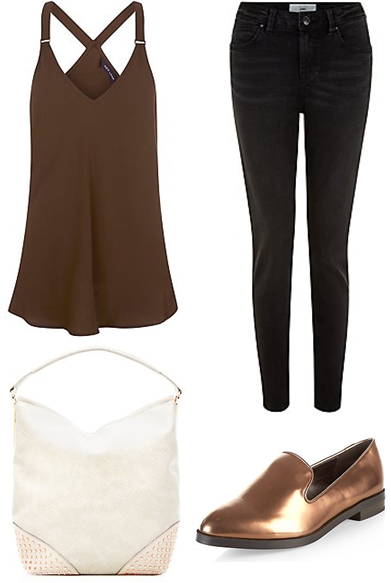 This tan shopper bag was perfect for what I wanted to create and the loafers added the shine to make this outfit that much cuter! If you can honestly tell me that you have never had a lazy day when it comes to your outfit either one, you're lying or two, you have a wardrobe bursting with clothes! Wednesday is about the time when I start to worry about what outfit I can put together next but it doesn't have to be that hard. 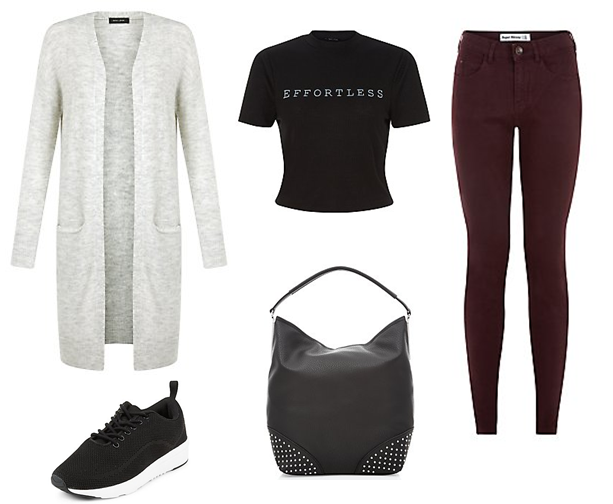 Simply get your comfiest pair of jeans, add a slogan t-shirt, your favourite trainers and, for a little bit of edge, pick out a black studded bag. Also, we all know that when the seasons change it can get chillier so be prepared with a light cardigan or jacket to make sure you're not the one shuddering in the corner of the room by the heater! The rock concert vibe? Yes please!! 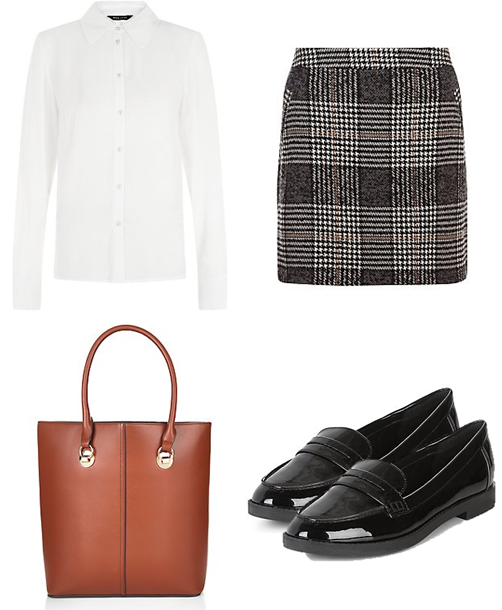 I am pretty much in love with check shirts (I would have them in every colour if I could) and the fact that they always go well with black jeans, whether they're ripped jeans or skinny jeans or ripped and skinny jeans combined like the ones in the picture - I just love them! Just a side note, I am very aware that this outfit has a lot of black in it but to be honest you can never go wrong with black! 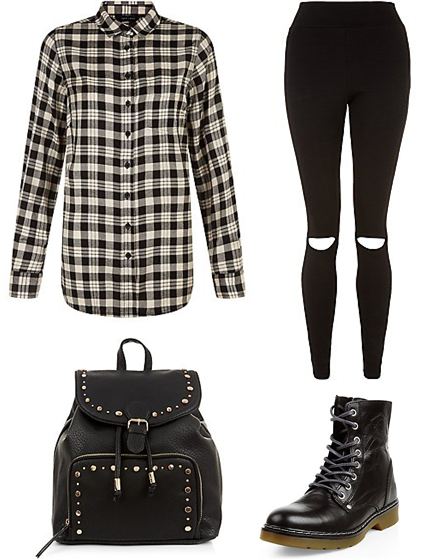 To finish off the look I added these Doc Martin dupes and a super cool studded backpack, big enough to fit your books in! Fri-YAY!!!!! You've made it to the end of the week and no fashion faux pas so far - I hope! So it's Friday and the weekend is just around the corner so to me, your outfit should definitely be the preface to the fun that is going to be had in the next two days (after you've done your homework/studying of course) and what better way to do that with some statement shoes! These bronze loafers just scream party and the hardware on the bag compliment them perfectly. Keep the rest of the outfit simple by pairing some black skinny jeans with a flowy top and just let the shoes do all of the talking!